I can’t let this week pass without addressing the fact that it’s National Eating Disorders Awareness week. Bringing awareness to eating disorders and disordered eating is so important. Even though I feel like we address certain aspects often (hello amenorrhea and female athlete triad), the questions I keep receiving via email on this subject combined with continuing to read about runners who are literally running their bodies into the ground, drive me to further rehash the importance of eating enough and taking care of ourselves. The theme for NEDA week this year is 3 Minutes Can Save A Life. The focus is on the importance of early intervention so maybe, in the time it takes for someone to read today’s post, I will be able to help someone. While putting together the series of recent posts about finding balance between our diets and our workouts, Laura and I of course discussed the female athlete triad. Without enough food (energy), your body shuts down your menstrual cycle because it just doesn’t have enough to work with to keep all systems going — Almost as a way to say, no way can you grow a baby, not enough energy here. Over time, amenorrhea can lead to bone loss (since no period can mean low estrogen), osteoporosis, stress fractures, injuries, infertility, slowed metabolism, and so many other problems. Even if you are on the birth control pill to regulate your estrogen levels, you are still at risk for the female athlete triad if you are restricting your calories. The pill does not solve things – it is masking the problem. I don’t really know how else to continue to point out that not getting your period, 9 times out of 10, is likely due to the imbalance between calories in and energy out. Each month that passes without your period is another month closer to the negative health effects listed above as well as random symptoms like insomnia. Did you know that? I don’t know how to continue to say that even if you think you are eating enough that it may not be enough for you. That’s the thing that is really worth pointing out this week – You don’t have to fall into the framework of the traditional eating disorders of anorexia or bulimia to suffer the ill effects of both. You may eat and eat often but not enough for your body. Not eating enough can still cause damage. It’s true. When I dealt with amenorrhea, I weighed enough for my height but it was not enough for ME. The doctor said I am eating right because my weight is within range. No, it’s very possible that it is not enough for you if you are not getting your period. And you know it! Only you know what you are eating and how much you are running. The doctor only knows what you share, only knows the height to weight chart and very often, does not know to look for signs and symptoms of female athlete triad. So many females remain in denial, which I do understand since I was there once too but gosh, it’s so frustrating to watch. Not just for me but for your family and loved ones. In fact, so many female bloggers fall into this category that I am struggling to watch and to read. I am unfollowing Instagram accounts quite often lately and I am ready to unfollow blogs too, not because I don’t care about these people but because I just can’t watch. It’s not healthy for me to see. Sometimes if you are reading and seeing things over and over, you can start to think something is normal (when it isn’t) and question your own sanity. I did catch a terrific quote on Instagram over the weekend though; my thoughts EXACTLY. I need to follow more accounts that say things like this rather than see images of women with scary bones showing in their pictures. 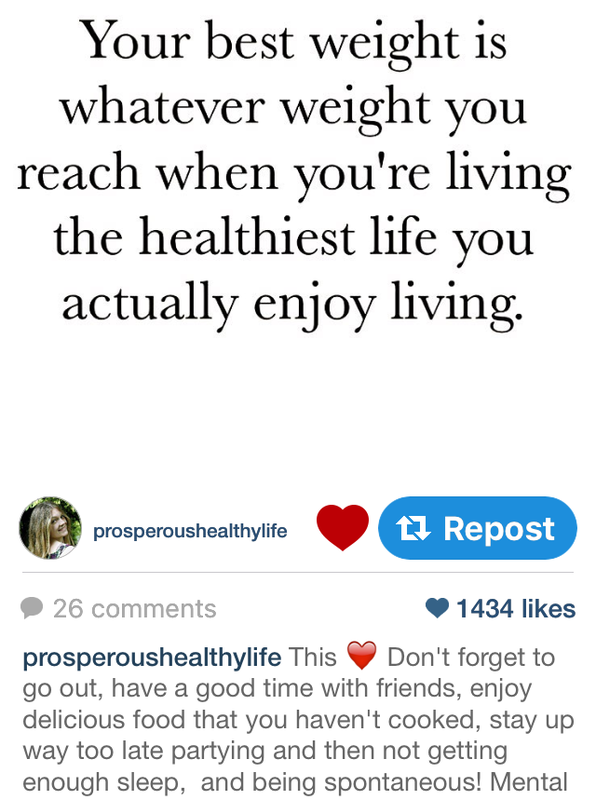 So anyway, I am not a doctor but from my experiences, I have written a ton of posts on the topics of disordered eating, amenorrhea and finding balance which are here for you to read, reread and hopefully feel inspired by, if needed, to make the changes you need to live the healthiest and happiest life possible. A Life Without The Scale – One of the very first posts I wrote about giving up the scale and my experience with amenorrhea. Finding Balance Between Clean Eating & Living – I forgot I wrote this post last year! I was just thinking to write something similar until I saw it pop up in my stats last week! It says everything I still feel about eating a healthy diet yet not so ridiculously healthy and restrictive that you can’t go out with friends to restaurants and enjoy yourself. There’s very little point to being so crazy healthy, organic, sugar-free, paleo, meatless, vegan or clean if all you do is sit in your house making your own meals for the rest of your life. It limits your being and that, well at least in my opinion, is not living. And not healthy. Do you really need to lose 5 Pounds? – So many times we struggle with those 5 pounds when really, we don’t actually need to lose them. Amenorrhea talk – A no-nonsense approach to the subject. Jeans Can Lie – Last year’s NEDA week post, love this one. Laura is also talking about the Female Athlete Triad so click here to see her informative post. 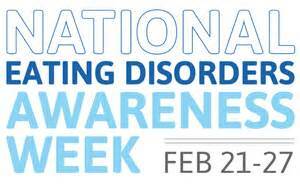 For more information on NEDA week and eating disorder help, click here. I’m glad you continuously share this important information! It is really scary to see people who are struggling but don’t realize it, especially over social media. I was reading an article yesterday that actually said workout videos can often times lead to a serious misperception about realistic expectations of how our bodies should look, and it seems like social media can do the same. I feel like I saw the article you are talking about – something about fitspiration is turning into thinspiration. Ah yes, you know how I feel about this! I definitely think it’s tricky because you can easily be fooled into thinking you’re healthy when you’re just NOT. Getting a regular period (without hormones of course) is a huge indicator of a woman’s health, but, honestly I’ve been too thin/overexercising and STILL had a regular period so it’s not the only thing! Enjoying life, eating, getting a period, I think in our hearts we really do know when we’re at our healthiest. yeah, I know people who still get their period and you are right – we know when we are being healthy and when we aren’t. We know ourselves best! Thank you for this post. Such an important topic. Thank you so so so much for this post. I truly believe this topic cannot be stressed enough. It’s not normal not healthy to get stress fractures or skip your period all the time (especially if you don’t have other illnesses that cause hormonal issues even with a healthy energy balance). I remember in college though how focused so many of my friends and I were on being thin, and then how many of my friends developed period problems those same years. And what really gets me is how recent this obsession with hyper thinness is—even back in the era of corsets, women ate better. you are right, women back in the day ate more than today. I think social media is playing a major role in promoting the constant exercise and constant dieting. there’s no balance. Thank you for writing this. I too feel incredibly strongly about this topic, especially the main thing you pointed out. I was never officially diagnosed with anorexia because I didn’t fit the exact model for it, but I struggled with an ED for nearly ten years and during that time I went through two period of amenorrhea (one before running, one after) that lasted 18 months each time. What got me to really see what I was doing to myself the second time around was that if I kept at it, I was going to affect my ability to have a family, and I was realizing that was what I truly wanted. It’s something that strikes you in a way nothing and no one else can. I am glad you had the moment where you realized the damage it could do. SOme people never realize or at least, never do anything about it. I also dealt with amenorrhea once for 18 months – I am glad I was able to be ok and was able to have a baby easily. It kills me to see how many people eat so, SO little for the amount of activity they do while thinking they’re eating enough just because they’re functioning “fine” or not losing any weight. Our bodies need so much more than we think, especially when we’re constantly being bombarded with all this 1200-1500 calorie nonsense. I love this post. I’ve never had an ED, but I have given up my scale because I was becoming fixated on a certain number/range and would drastically change my eating habits to keep meeting that. When I trained for my first half marathon I was still obsessed with cutting carbs so I wouldn’t gain weight, and I’m so glad I learned from that mistake. I make sure I eat enough to keep my energy levels up and eat MORE carbs the more I run. Yes to giving up the scale! I love that you bring this up every year! It is so important and not brought up enough! I always love how you write about these tougher topics. You know I couldn’t agree with you more. Ugh , social media can really be a bad thing. It’s so hard to find the accounts that won’t make us feel that way. Posts like this are so important. I was overweight (obese) and lost a lot of it through restriction and over exercising which lead to bulimia in my mid/late 20’s (which I don’t talk about too much). I think my journey into distance running plus my later Crohn’s diagnosis helped me understand food as essential fuel + nurishment more but I would be lying if I didn’t say I don’t still struggle with food and body issues. And the social media sharing is a whole other beast which I think sets up unreasonable expectations. Yeah, social media can really be a bad thing if looking at the wrong accounts. Thank you thank thank you for saying everything that you did here. Less than a year ago I was caught in the situation you described. Through continued hard work, I’ve made so much progress and started eating MUCH more and more variety. Posts like this keep me motivated to keep going towards recovery. And for the first time in years, I’m getting a regular period and I couldn’t be happier! For me, this week is about celebrating and journey that continues. You know what I always say, five pounds only matters if it impacts your health. Thanks for being such an advocate against eating and exercise disorders.